I remember the moment in 2011 when I heard a piece of music that changed my life. I was surfing through YouTube looking for Mozart's Ave Verum Corpus. This was a period of time when I was exploring scared music, which I have always loved, but admittedly knew less about than other classical music. I saw a video for Ave Verum Corpus and clicked it. A few moments into the video, it was clear this was not Mozart. But who? I read the description and learned that this was Ave Verum Corpus by Imant Raminsh. Who is Imant Raminsh? Before I tried to figure that out, I watched and listened to the video....an absolutely gorgeous, spellbinding work, performed by the University of Utah Singers. I literally sat there frozen by what I had experienced. So I listened to it again....and again....and again. Today, in 2017 as I write this, I still come back to this work frequently. The recording itself is very bright and clear. The performance is exceptional. The voices blend together so beautifully. The human voice is the finest instrument of all...and choral singing of this quality knows no equal. Anyway, I read all I could about Imant Raminsh and became a big fan of his music. 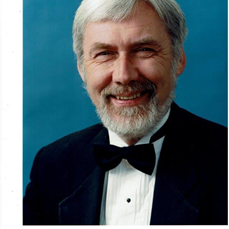 He is a composer, musician, teacher, and conductor from Canada. I decided to see if I could contact him and talk to him about his music. He was very gracious to me and agreed to answer my questions via email and let me share his answers it in this blog. TH I first learned about you when I “stumbled” on a video of Ave Verum Corpus on YouTube…your Ave Verum Corpus…performed by the University of Utah Singers. I was absolutely blown away and transfixed by it. It remains one of the most beautiful pieces of music I have ever heard, which is why I have sought you out to talk to. I appreciate your willingness to answer my questions. Where did your Ave Verum Corpus come from...meaning tell me about when it was composed, your inspiration for it etc…. IR In 1972/73, I took a trip around the world that included trekking into Everest Base Camp and some small climbs in that area, exploring Sarawak (north Borneo) and crisscrossing Australia where I had lots of relatives. It was while I was in Adelaide staying with my aunt and uncle that the urge came upon me to write a short motet. In the botanical gardens that were close to where I was staying there was an immense Araucaria tree at the base of which I would often sit and contemplate. It was there that the Ave Verum Corpus came to be written in a couple of days. The choice of text was out of homage to Mozart and there are a couple of hidden references to Mozart’s Ave Verum Corpus in mine. TH Where did you grow up? IR I was born in Latvia in 1943 but our family fled westward in July 1944 with the approach of Russian tanks, and we spent the end of the war years and the first post-war years as refugees and later, transit camps in Germany. We came to Canada in the Summer of 1948 and settled in northern Ontario where my father was employed as a forester and my mother supplemented the family income by teaching piano (she had finished a piano performance course at the Riga Conservatory before the war.) Later, I moved to Toronto to pursue violin studies at the Royal Conservatory while finishing high school. TH Did you hear classical music in your home during childhood? IR Yes, of course. All of my siblings (3 sisters one younger brother) took piano lessons. I also took up violin. We did have a record player. TH Are there any composers who you would list as your primary influences or favorites? the works rather than the composers. I remember being completely stunned the first time I listened all the way through Bach’s St. Matthew Passion. TH One of my standard questions for musicians and composers is: do you actually listen to much music in your free time? I find that many say they don’t because they play music for a living and therefore want to get away from it when they are not working, which I think is sad, What about you? IR Who has free time? Mostly I listen when I am driving but hardly ever at home. My composition takes place away from any instruments and my wife says you would never know there was a musician living here considering how quiet the house normally is. TH What instruments do you play? IR My primary instrument has always been violin and I was for many years one of the principle violinists in the Okanagan Symphony (British Columbia), but I play viola as well and my piano skills are generally good enough for accompanying students. TH Where do you live? IR My wife Becky and I and our golden retriever Jaspor live in Coldstream B.C. (adjacent to Vernon, B.C.) in the Okanagan Valley. The north Okanagan is a transition zone between the dry, arid bunchgrass-Sonoran desert to the south and the interior Montana Douglas Fir/hemlock/cedar rain forest to the north and east. TH I write a lot about classical music in our culture. I’m not sure about Canada, but here in the US, it has a very small audience. Are you optimistic about the future of classical music? IR Classical music requires time and effort to listen to-also an extended attention span and ability to focus. Audiences will always be smaller than for big pop events, but they will always be there. TH If you had to name your top 5 composers, who would they be? IR This list will always change from day to day, but J.S. Bach, will always be there. TH This may seem like a stupid question, but as amazing as you are, why haven’t more people heard of you?....and I mean this in the nicest possible way because you are an amazing composer!!! IR I don’t know why more people haven’t heard of me. Maybe it’s enough that you have. How many do I need? TH Are you a baseball fan? IR Not particularly. My sports are hiking, cross country skiing, canoeing, and such. TH Do you like coffee? IR Yes!!! Dark roast-maybe Sumatra-black if its good coffee-often with cream, but no fancy other flavors. Coffee is one of the food groups (also chocolate). TH Thank you so much for your time and help with this. If you are ever in the Kansas City area, please give me a call and we can meet for coffee. Here is Ave Verun Corpus by Imant Raminsh, performed by the University of Utah Singers.